LittleLife child carriers help you to easily share your love of the outdoor life with your child by providing a safe, secure environment whilst on the move. Constructed using high quality materials and designed to provide hours of comfortable, stable seating for your child, the range of LittleLife child carriers offers a variety of innovative features which allow adequate carrying capacity for both child and those essential items like spare clothes, wipes and refreshments. Of course a child carrier has to be designed not only to provide comfort and security for the child, but also has to be comfortable for day-long use by the wearer. 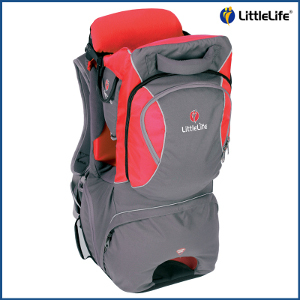 LittleLife child carriers have anatomically designed 'Comfort Adjust' back systems, with design methodologies from high level mountaineering rucksacks, and use the latest materials to provide comfort and stability for the wearer. Furthermore, the new Freedom and Discoverer carriers incorporate an air flow backsystem for improved cooling. Each carrier has many different possible adjustments to ensure that both driver and passenger can be comfortable and secure, while sturdy quick release fasteners allow easy access once the right adjustments have been achieved. Cozymole have the full range of models on offer from LittleLife, including the top-of-the-range 'Voyager S2' which gives class leading comfort and carrying capacity and includes a detachable daysack and free sun shade. The range offers something for all needs, whether you require a minimalist carrier or a fully featured one. There is also a range of accessories available which keep you comfortable as the conditions change, such as the simple neck pillow which stabilises your childs head when they're feeling sleepy in the carrier.